As ‘the most hated bull market in history’ approaches its tenth year, with the S&P 500 having delivered over 350% total cumulative returns since its post-crisis lows, investors are becoming increasingly nervous about the outlook for returns and dividends. Global growth appears to be strengthening and becoming more synchronised, and the first tentative steps towards monetary policy ‘normalisation’ have been taken in the US and the UK. However, the outlook remains far from certain. There are a number of risks that could derail this fragile global recovery, ranging from fiscal and monetary policy error to escalating geopolitical tensions, protectionism and ever-increasing debt levels. 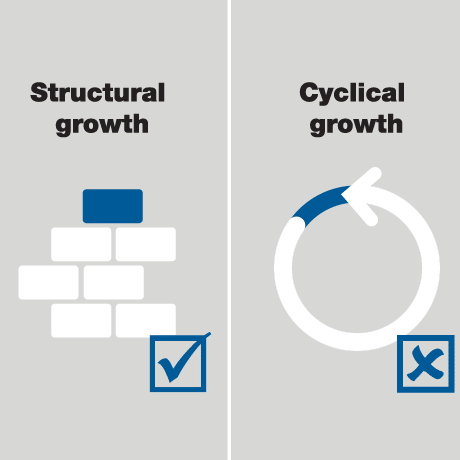 Against this uncertain backdrop, and as we look forward to 2018, we believe a focus on structural rather than cyclical growth will be key. One cannot rely solely on the fortunes of exogenous factors such as commodity prices, interest rates, or the economy to sustain growth. As has been the case in 2017, particularly in the technology sector, we expect the market to again reward quality companies that prove their ability to deliver sustainable growth in earnings and cashflows, and punish companies across the market whose earnings disappoint. Source: Investec Asset Management and FactSet, as at 30.09.17. Investec Global Franchise Strategy re-weighted excluding cash and equivalents, since inception. We are mindful of the threats that also exist to the future growth of Quality companies. For example in consumer staples disruption from the ‘infinite shelf’ of e-commerce, is lowering barriers to entry and supporting smaller brand and private label penetration, thereby increasing fragmentation across categories. However, the impact of this and other trends will not be felt evenly across companies. In many cases it will likely provide opportunities as well as risks. Careful stock selection will be required. Equity markets have re-rated significantly since the Global Financial Crisis and are no longer cheap. In the context of a low-growth, low-return world, however, we do not believe that the valuations of quality stocks are overly stretched. Relative to longer-term history, we believe the valuations of quality stocks remain attractive, given the quality and growth characteristics one is paying for and the valuations of bonds and other assets. Again, however, stock selection will be key. In 2017, investors have been rewarded for successfully picking stocks that have delivered growth. However, perhaps more important to investment performance in 2018, will be avoiding the losers rather than picking the winners. This will require careful management of downside risk, including both business and valuation risk. Again, active stock selection will be critical. Overall, while more economically sensitive sectors with global exposure, such as energy and mining, have rallied recently, the sustainability of this rally is uncertain. We believe that carefully selected quality companies, with long-term structural rather than short-term cyclical growth drivers, should be well placed to perform well in 2018. We will continue to focus on finding these attractively valued quality companies, with demonstrably enduring competitive advantages that are able to continue to grow their cashflows into 2018 and beyond.